Are we in need of a little comfort? This is basically enchiladas for lazy people. I found this recipe over at Smitten Kitchen a couple of years ago and made a few tweaks to lower the points... enough to add avocado and still meet my nutrition goals. I also switched in kale, in lieu of spinach. Kale is better in baked tomato dishes, also, it was in my fridge. 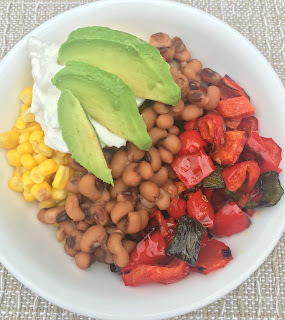 With over six cups of vegetables, and corn and beans being "free" on the new WW plan, one can enjoy this filling, delicious, AND EASY comfort dish, that won't screw up your diet. And these days, I feel we are all in need of more than a little comfort. Warning, there are no chips, or cheese, but we like NOT-chos enough to eat them once a week. The richness of the avocado, the earthy black-eyed peas, and the spicy-sweet char on the peppers scratch the nacho itch without the uh-oh after. After the recipe are some thoughts on how to eat healthy, without giving up the tastes you love. 1. Preheat oven to 400° and line sheet pan with foil. 2. Toss peppers with olive oil and spread on sheet pan. 3. Roast at 400° for 30 minutes. Remove from oven and scrape pan with spatula to free any charred on peppers. Set aside. Was it a great summer or what? Guys, so many wonderful books, especially, Americanah, by Chimamanda Ngozi Adichie, and The Cooking Gene, by Michael W. Twitty. AND TRAVEL. Washington! Oregon! Arkansas! Kentucky! Mississippi! and back home to Austin, TX. Summer of ADVENTURE, and a slight fluffiness. So, back to Weight Watchers, right guys? This lady jumped back into her meetings. Last week we all dug around the app for new recipes to get back on track for fall. Voila! 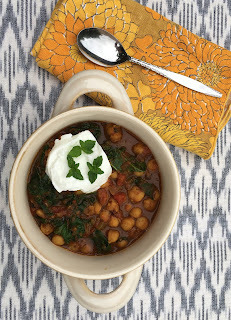 I ran across their recipe for Senegalese Peanut Stew with Spinach and Sweet Potatoes, totally in keeping with the theme of Summer of Adventure, but less calories. Win. Win, win, win.